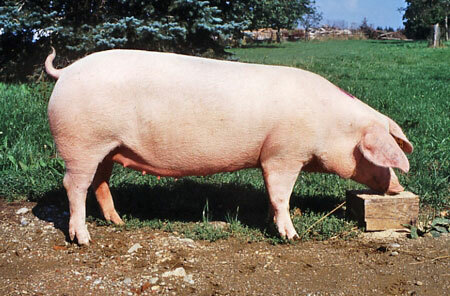 German Landrace pigs were developed around 1900, in Lower Saxony, Germany from carefully selected pigs from the area. During the years of 1948 to 1958, there were importations of Danish and Dutch Landrace that were used to further improve the breed. German Landrace pigs are very similar to other Landrace pigs; they are white heavy drooping ears. However, they are not as extreme in size and length as some of the Landrace strains of other nations. German Landrace pig breeding selection efforts have been especially directed toward excellent fertility, heavy milking, and good mothering. There has been special attention, following weaning, to efficiency in feed conversion and to high cut-out values. German Landrace pigs have proven very useful in crossbreeding and in improving the general performance of swine in Germany. About 1,000 swines are exported each year to other countries.